In a large mixing bowl beat the eggs until light and fluffy using a whisk. Mix together the ingredients into a food processor and pulse the ingredients until mixed well. Cover a baking tray with baking paper or foil and give it a spritz with aerosol cooking spray. 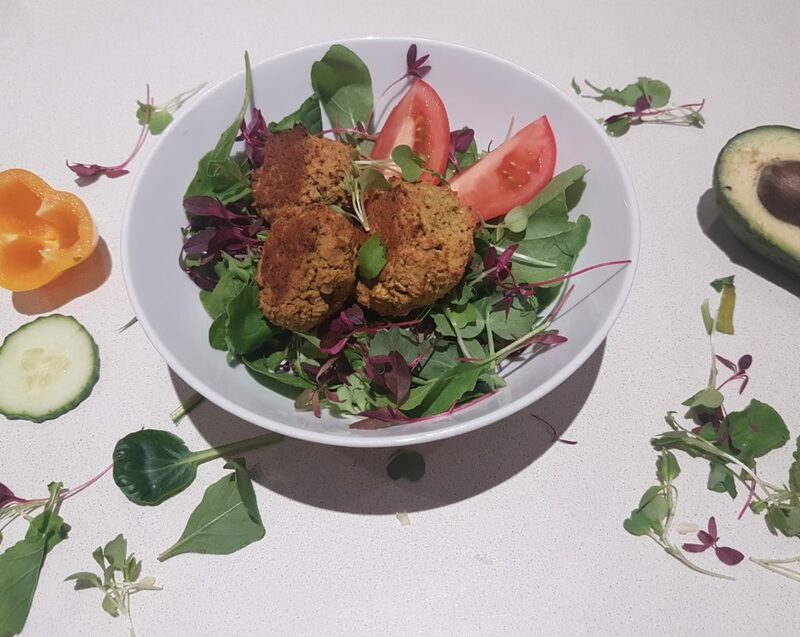 Use a spoon to scoop out some of the falafel mixture and roll into a ball using your hands. Next, give the balls a quick spray with your aerosol spray. Bake for 15 minutes and then turn the balls over. Repeat step 6, giving them another thin coating of oil. Remove from the oven and allow to cool before serving or refrigerate once cooled. 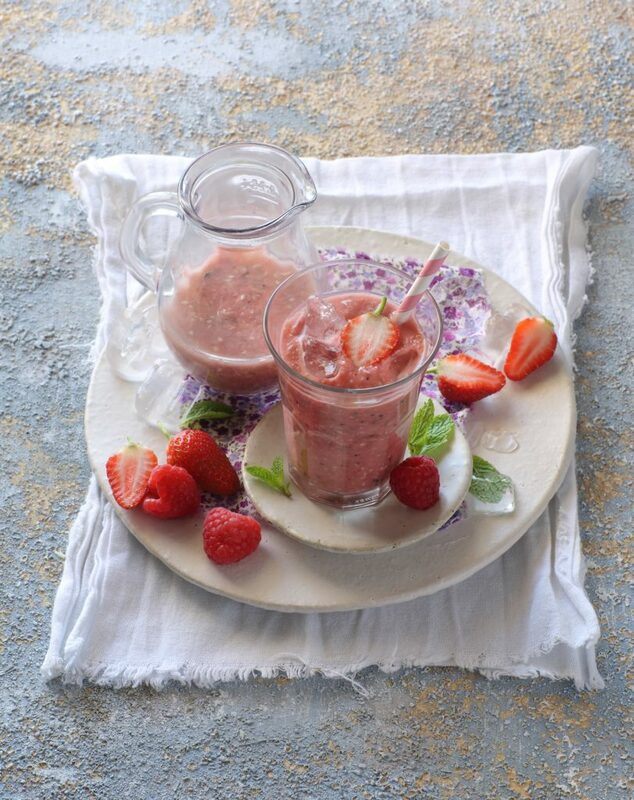 Whizz the ingredients in a blender. 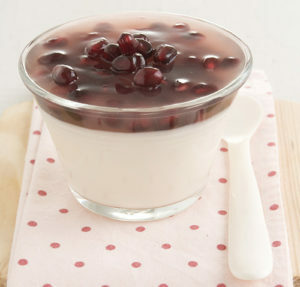 Serve with two rice cakes topped with smooth herb cottage cheese or peanut butter to make a balanced meal. Mash the avocado on a plate. Mix but taking care not to over mix the dip. 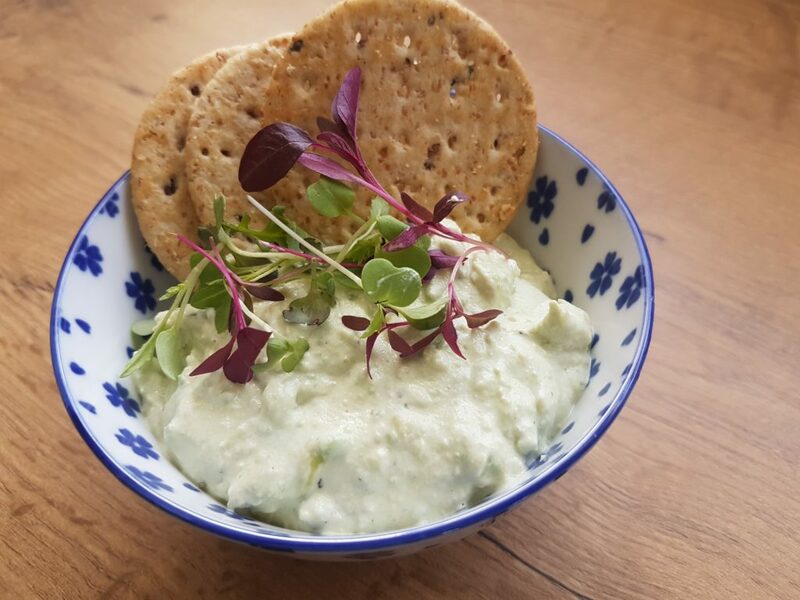 Keep cool and serve with veggies, wholewheat crackers etc. Pour 250 mL of boiling water into a suitable jug. Add the 6 tea bags to the boiling water. Allow to soak and chill in the fridge. 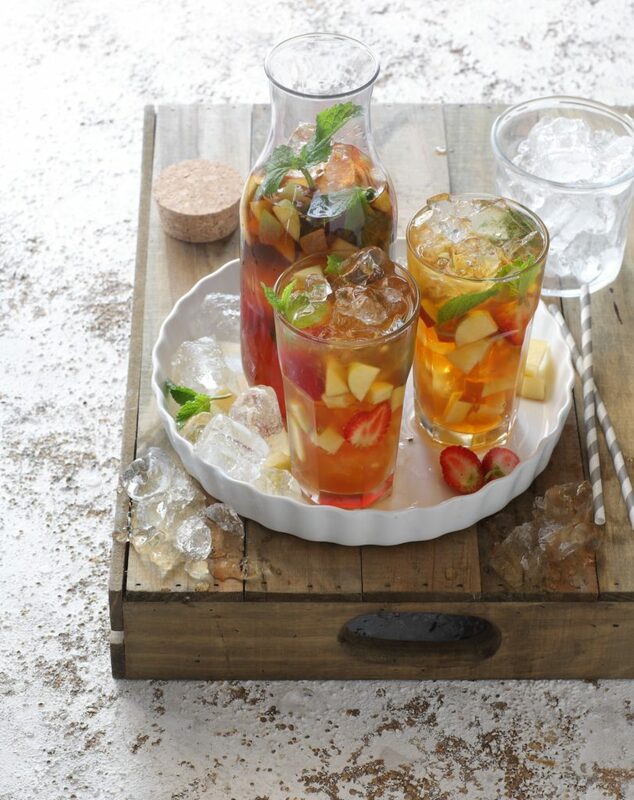 Once the tea mixture has chilled, add the tea mixture to the 1L of chilled water along with two handfuls of mint, the chopped apple and strawberries. Lastly add the berry juice and ice to serve. Place the grated onion, garlic and ginger, ground peppercorns, fish / soya sauce, sugar and chopped coriander leaves in a bowl. Mix all the ingredients. Add the mince, oats and beaten egg, and mix well, ensuring that all the ingredients are well mixed into the meat. If the mix does not stick together add another tablespoon of oats. Using 1 tablespoon of mixture at a time, roll the mix into 16 small balls. Gently heat a frying pan that has been sprayed with aerosol non-stick cooking oil. Place the mini meatballs side by side into the lightly greased pan. Cook on low heat for 7 minutes until the underside of the meatballs are brown. Turn all meatballs and cover again. Cook for 5 minutes until the other side of the meatballs is browned. Remove the meat balls from the pan and leave to cool while assembling the salad. 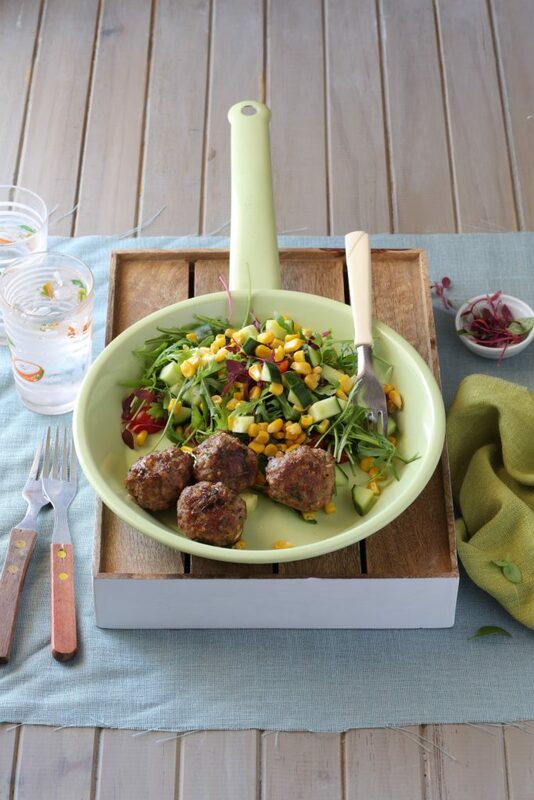 To make the salad, divide the salad leaves, sliced cucumber, tomatoes and rocket onto 4 dinner plates, add the drained sweetcorn and the cooked meatballs and serve with a drizzle of sweet chili sauce. Place peanut butter in a bowl and mix until slightly softened. Stir in the plain yoghurt. Mix well. 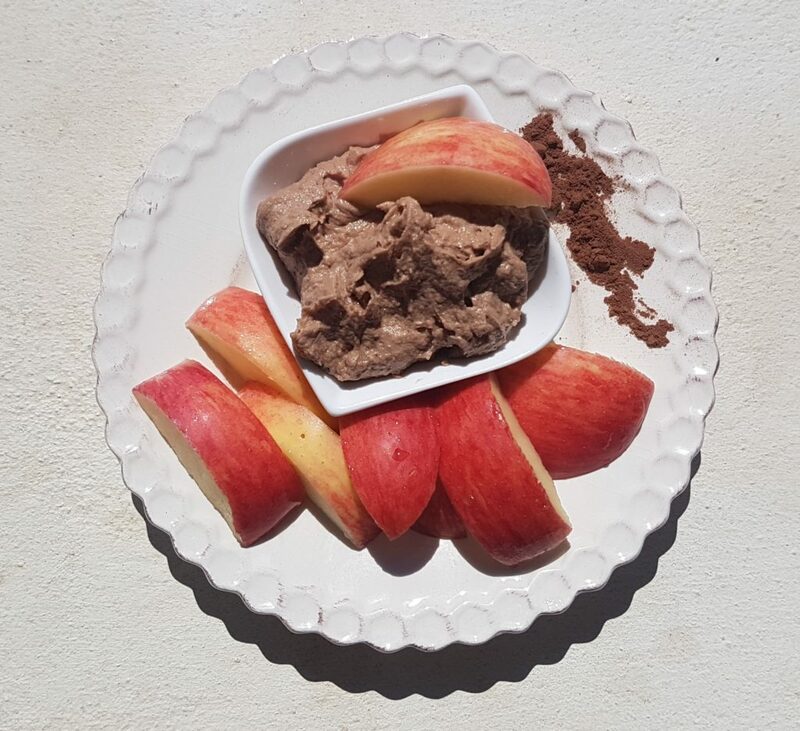 Serve peanut butter chocolate dip with fruit wedges to your liking. Bring a pot of water to the boil. Cook the pasta in a pot of boiling water according to the packet instructions. Set aside once cooked. Meanwhile, on a medium heat add the olive/ canola oil, garlic and ginger to a large non-stick saucepan and sauté for 5 minutes. Add the cubed chicken to the large saucepan and allow to brown gently. If you need more moisture in the pan, add bit of water to keep the chicken moist. Once the chicken has cooked through, add the two peppers and red cabbage and sauté for 5 minutes. Then, add the spinach in batches (it soon cooks down) until all the ingredients are soft but still crispy. Alternatively, put the spinach in a colander and run hot water over the spinach to wilt it. Mix the light hummus with the milk in a jug, stirring out all the lumps. Add the pasta to your saucepan. Then pour the hummus mixture into the saucepan and allow the sauce to cook in at a low heat for 5 minutes. Serve immediately with additional black pepper if desired. One serving is equivalent to 2 carbohydrate, 4 protein and 2 vegetables. This dish is likely to become family favourite. Packed with vegetables and it has a wonderful creamy consistency. Cook the spaghetti in lightly salted water until done. Heat the oil in a large sauce pan, gentry fry the onion and garlic until the onion is transparent. If the onion mixture starts to stick to the saucepan, add 15-30 mL (1-2 Tbsp) boiling water - do not add more oil. Add the mincemeat, breaking it up while stirring and fry gently, until browned. Add the diced tomatoes, green pepper, grated carrots, mushrooms (optional), herbs and spices to the saucepan. Add the tin of lentils to the saucepan. Add 15-30 mL (1-2 Tbsp) boiling water should the mixture lack moisture. Simmer for 5-10 minutes. Add the diced tomatoes and tomato sauce, simmer for 5 minutes. Add salt and pepper to taste. Simmer for another 5-10 minutes. Lightly mix the cooked spaghetti into the mince and lentil mixture, if desired. Spoon onto a serving dish and sprinkle with Parmesan cheese. Serve immediately with one cooked vegetable or a tossed salad. 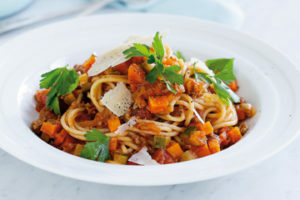 Using Parmesan cheese when cooking is often beneficial as it provides a strong cheese flavour therefore reducing the amount of regular cheese used in the dish. Barely must be one of the MOST UNDERUTILIZED grains that you get. 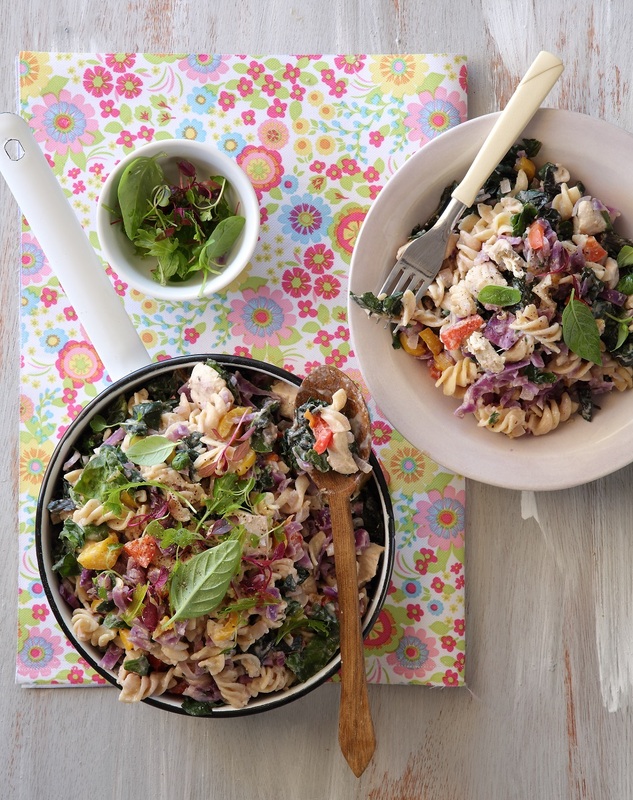 Most people just chuck it into a soup but here is a great recipe which allows you to make fantastic salads using barley as a source of HEALTHY CARBS and GREAT SOURCE of FIBER! Add the chopped peaches, green pepper, onion and baby spinach (optional: add Rosa tomatoes) to the salad bowl once barely has cooled. 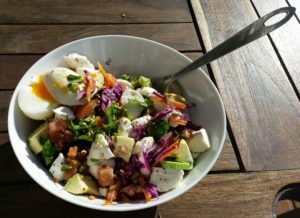 Store in fridge or cooler bag until ready to consume - leaving this salad to stand for an hour or two will further develop the flavours. 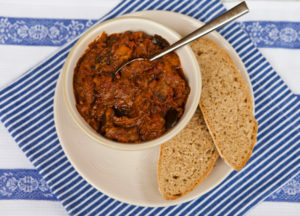 Who needs butter or margarine when you have this AWESOME RECIPE for Aubergine Spread... So delicious and great way to get in your vegetable quota! Omega-3's are important for good health, especially heart health, eye site and brain functioning. Research has shown that the consumption of fatty fish is beneficial to health and that we need to try ensure that we get in at least 90-120 g of fatty fish at least two times a week! This can be quite tough for some as fatty fish and omega-3 sources are: salmon, trout, mackerel, snoek, tuna steak, sardines and pilchards. In South Africa, the price of salmon and tuna is just RIDICULOUS! Most of us cannot justify spending that amount of money and the sad reality is that we also don't really consume the really affordable sources such as sardines and pilchards (even though they are READILY AVAILABLE and AFFORDABLE. 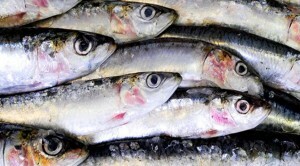 So here is a RECIPE to help you boost your OMEGA-3 intake by learning how to cook with sardines! Get it a go, you will never know if you like them until you try them! Do you follow the Meatless Monday initiative? If not, don't be skeptical - I am not transforming you into vegetarians or bunnies but rather appealing to you to try have one meatless meal a week, it doesn't even have to be a Monday! WHY Meatless? Because going meatless once a week may reduce your risk of chronic preventable conditions like cancer, cardiovascular disease, diabetes, and obesity. And going meatless once a week can also help reduce our carbon footprint and save precious resources like fossil fuels and fresh water. South Africa launched Meat Free Monday in 2011, with support of the Fryes Family Foundation. Around the country over 600 restaurants support the movement with vegetarian options. Over 20 schools, like-minded organizations participate in the campaign. National universities support Meat Free Monday, including University of Cape Town, University of KwaZulu Natal and Varsity College Durban. Campaign organizers have spoken to over 16,000 students in schools they are very passionate about the movement. 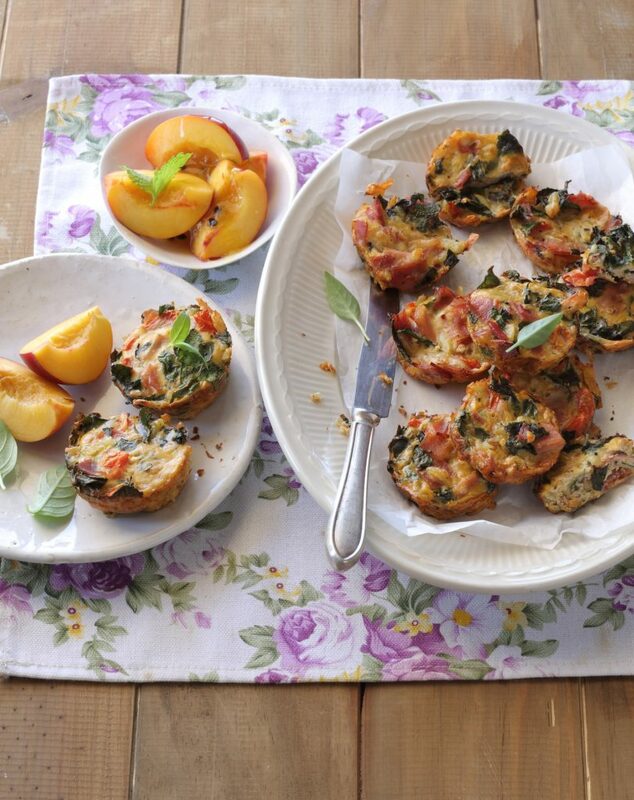 Here is a recipe to help you practice Meatless Monday's... this must be one of my favourites! ENJOY! 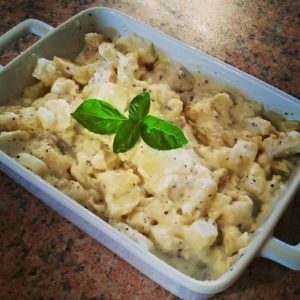 Without a doubt, this is one of my favourite recipes. Why you ask? Well, because it has so many uses 🙂 You can either use it for: 1) Protein source at dinner, served with sundried tomato flavoured couscous and steamed crisp fine green beans 2) Lunch box idea (who needs to buy those expensive chicken fillets they sell for an arm and a leg, rather make your own on a Sunday in preparation for the week) 3) Toppings for sandwiches - for your partner and kids, use with lemon juice and a little light mayonnaise and plain yoghurt Give this recipe a go, really tasty and so quick and easy! Combine the oil, origanum, all spice, cumin, cloves, garlic and lemon juice in a bowl. 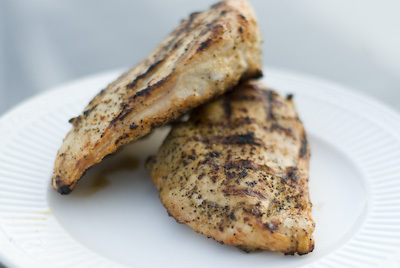 Place the chicken breast on your roasting/ baking tray and apply the marinade evenly over both sides of the chicken breast. The best way to do this is to apply the marinade with a silicon brush. Place your roasting/ baking tray in the oven and grill for about 15-20 minutes, turning twice until the juices run clear. Should there be left over marinade, you may baste again half way during cooking process. Remove from the grill and keep warm. Meanwhile prepare the couscous - follow packet instructions, ensure you do not use a whole stock cube - always use half of what you usually use. For flavouring use lemon juice, vinegar, herbs and spices instead. Mix the chopped peppadews and mint to the couscous. Serve the couscous on a plate with the chicken placed over it. For flavour add lemon juice and black pepper. For side dishes, include tossed salad or two cooked vegetables. 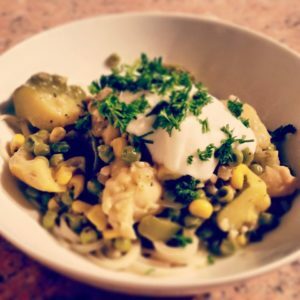 Hake Chowder Recipe for a Chilly Autumn Evening! 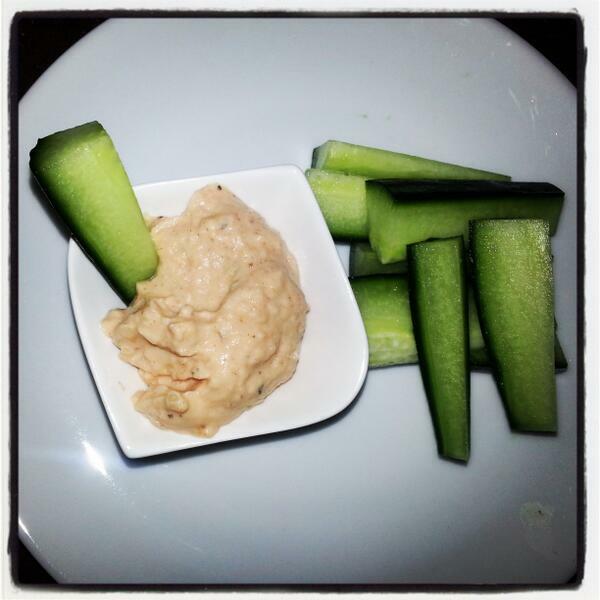 This is a FANTASTIC recipe as it is QUICK, EASY and HEALTHY! We should be trying to consume fish at least twice a week. Fish is a good source of iron, it is also low fat, a high biological value protein and great source of iodine and other minerals.. Dish up the noodles in a bowl aiming for 1/2 cup - 1 cup per portion (depending on your needs) and top with the coconut milk and basil flavoured hake madellions which should now be nice and juicy! 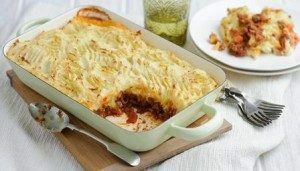 Who doesn't enjoy a good old traditional Cottage Pie. 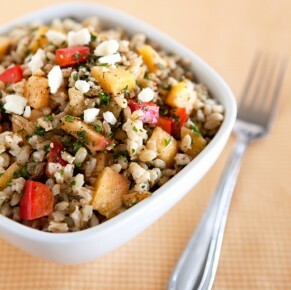 Make most meals during the week nutritious and packed with goodness! 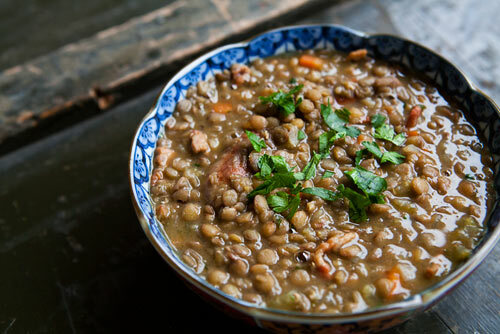 This recipe is great as it is a good source of fiber (added lentils) and it uses leaner forms of protein and canola oil as a source of healthy fats. Peel the potatoes and boil until just soft. Heat the oil and fry the onion and garlic until the onion is transparent. Add the mince, stock powder or stock cube, herbs (and optional spices if applicable), lemon juice and pepper and stir-fry for 5-10 minutes to brown the mince. Make the topping by adding the milk and mayonnaise to the potatoes and mash the potatoes until light and fluffy. Spread the mash potatoes over the mince mixture in the ovenproof dish. Sprinkle the cheese over the top as well as the paprika. Bake for 20 minutes, or until heated through and bubbling. Soup, the comfort food of winter! 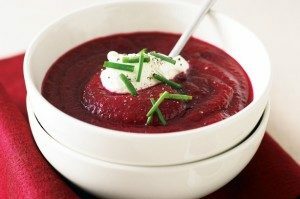 Here is a fantastic recipe for beetroot soup. Packed with goodness, flavour and it is super delicious. According to an article by Today's Dietitian - one of my favourite magazines (I wonder why!?)... A diet rich in vegetables has cardiovascular benefits that have long been well documented. It's been proposed that these health effects may be due, in part, to vegetables' high nitrate content. While nitrate is found in all vegetables, it's especially abundant in beetroot and leafy greens. Dietary nitrate lowers blood pressure, thereby helping protect the heart. DID YOU KNOW? Beetroot is a good source of nitrate. Dietary sources of nitrate are converted to nitric oxide and nitrite in the stomach. These substances have the ability to increase vasodilation therefore reduce blood pressure and improving cardiovascular function. 1) Trim beetroot stems and leaves. Peel and chop beetroot. 2) Heat oil in a saucepan over medium-high heat. 3) Add onion, carrot and celery. Cook, stirring for 5 min or until onion is tender. 4) Add beetroot, potatoes, stock and 1 cup cold water. Bring to the boil. 5) Reduce heat to medium-low. 6) Simmer, partially covered, for 1 hour or until beetroot is tender. 8) Process soup (hand blender = fine), in batches, until smooth. 9) Return soup to pan over low heat. 10) Cook, stirring, for 4 to 5 minutes or until heated through. 12) Ladle soup into bowls. Sprinkle with chives and a dollop of plain yoghurt. Dressing is optional (quantities dependent on how you like your dressings) however you could also just dress with 1 tsp olive oil and balsamic vinegar. 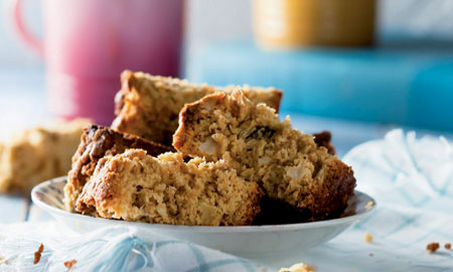 A recipe for healthier rusks. Mix the Jungle oats, cake flour, baking powder, nutty wheat flour, digestive bran, Pronutro, salt and bicarbonate of soda into a large mixing bowl. Add the raisins (and grated apple- if opted for) and sugar to the dry ingredients. Mix to incorporate some air. Add the canola oil, eggs and vanilla essence to the mixture. Add the buttermilk and blend all the ingredients together. The dough should not be sloppy, rather soft enough to spoon into your baking pans (choose a pan with enough space for the dough to rise). Don’t forget to cook and spray your pans!! Spoon the mixture into the sprayed baking pans and bake for 30 minutes at 180 then reduce the heat to 150 and bake for 45 minutes. Leave to cool on a rack. Cut into fingers and dry the rusks in a slow oven at 100 for 2-3 hours. High fibre, low fat way to start your day – remember EVERYTHING in moderation – just because they are healthier than commercial rusks doesn’t mean you can chomp away..